Interpersonal Skills | Learning Technologies, Inc. Effective communication and interaction with others is one of the most basic skills in business. From resolving conflict to basic communication, it’s a skill that has a huge impact on overall workplace effectiveness. These topics are crucial for building these skills, and can be used independently or in conjunction with other team building programs. Don’t forget that every session is custom-fit for your organization’s needs and culture. Knowing how to communicate is crucial to working well with others. Clear, direct expression and its counterpart, listening for the real message, can head off many problems before they can arise. Participants will learn about the importance, benefits and relevance of effective listening as well as what’s needed to be an active listener. Overcoming barriers to direct communication will also be discussed. Activities will be used to reinforce the learning process. Basics of Communication: This covers the fundamentals of effective communication, and what’s needed for shared understanding and common ground between speaker and listener. Understanding Communication Styles: Feedback and openness greatly improves communication with others. Focus will include emotional effects, tone of voice, body language and intent (real or perceived) of interpersonal communication. Working Through Communications with Others: Find out how your communications skills work with other group members in actual problem-solving and consensus-building activities. Listening (Self Assessment): How good are your own listening habits? There’s always room for improvement. Obstacles Between the Listener and the Speaker: Doing away with these simple barriers can greatly help understanding for yourself and others. Becoming an Empathetic Listener: Do more than just understand someone’s words – hear and understand their meanings and motivations. Communication relies on the ability to give and receive feedback. It’s vial for a clear understanding and further growth of relationships, and provides important information for the individuals involved. Feedback means continuous improvement for all involved. Why Feedback Is So Important: What’s the result of not receiving enough information, and what can be done about it? How Effective Am I At Managing Feedback: An honest assessment of your own ability to give and receive feedback means finding areas for improvement. What Are The Keys To Effective Feedback: Find out about the critical processes involved before, during and after a feedback session. Creating an Open Environment: Find out how you can best create an environment for open, direct communication. Using the Feedback Process With Others: Get hands-on experience in current, real-world instances, giving you tools you can take away when you go back to work. Filtering Communications: We all filter each other’s communications…find out how that works. Conflict management is one of the trickiest and most challenging problems managers and employees can face, yet conflict is inevitable. Learn how to bring about win-win outcomes, centering on skills that promote healthy conflict, and by looking at your own conflict resolution style. The result can be a creative, open environment that’s efficient and productive, where conflict doesn’t lead to acrimony. Participants will determine their style in conflict resolution by taking a nationally-recognized assessment test, then look into ways of modifying and adapting their own style. How Conflict Can Be Constructive: Disagreement is always going to happen, but healthy conflict can enhance productivity and creativity in a team. Know the difference between healthy and unhealthy conflict, and techniques for dealing with it more effectively. How To Deal With The Emotional Aspects of Conflict: Emotions may run high; it’s important for everyone to keep a cool head, not take things personally and not let them get in the way of good decisions. How to Use Different Conflict Management Style: Everyone approaches conflict differently. Learn how to evaluate your own style, and how to effectively use different styles according to the situation at hand. How to Have “Crucial Conversations”: Learn the best ways to approach different conversations. Examine how to speak directly, and how to make it safe for people to be direct and honest with each other. Reaching Win-Win Agreements: Learn about the five dimensions of win-win agreements, and how to use them effectively in conflict resolution. Abundance Mentality and “Emotional Bank Accounts”: Knowing the concepts of win-win can change perceptions, improve teamwork and firm up relationships. Learn how to not “overdraw” your relationships. What To Do If It Gets Ugly: Know how to handle tense situations and learn the best techniques for dealing with difficult or obstinate people. We often find ourselves in situations where we need to influence the direction of things, but don’t have any direct authority over the persons involved. The “Situational Influence Model” is designed to give you the skills you need for these situations. Specific techniques such as connecting, attracting, persuading and asserting can be very effective in shaping the course of action. Analyze when the best times are to use each of these different styles. The focus then shifts from our own goals and frustrations to understanding and acting on the needs of others. The “Situational Influence Model”: Each style of influence can be put to use positively and powerfully – learn the best ways to put them into practice. Influencing Techniques That Work: A variety of proven techniques are available to influence others. Examine the best time and place to apply them. Choosing The Appropriate Influencing Style: Analyze the critical factors that determine the best situations and times for any given influencing style. Identifying Real-Life Situations Which Require Influence: Recognize an ongoing “Influence Situation” and then design an influencing plan to put to use back at work. Discovering The Power Of Mutual Exchange: Learn to get what you want by helping others get what they want. This allows you to shift your focus from your own goals and frustrations to those of others. Using Creative Problem-Solving Techniques: There’s often “the third alternative;” find out how to use other win-win tools. Any team needs clear goals and direction to succeed. It’s crucial to establish clear roles and responsibility, for both productivity and the flexibility to manage change. This is a critical component at any level of an organization. Here we’ll set up expectations from the beginning, establish clear roles that everyone agrees to and is held accountable for, and develop job duties based on the team’s goals. We also set in place channels for clear communications, methods for dealing with conflict, and begin to identify potential obstacles to success. Understanding Your Guiding Principles: What are the pertinent values that help dictate all of your decisions? Developing A Team Mission Statement: What are top priorities for your team? Where do want to be? How will you get there? We’ll help you ask and answer all these questions. Developing Principle Centered Goals: Your goals should be centered around your core principle, and should always be in line with your mission. Creating And Utilizing Smart Goals: Use this specific formula to make sure your goals are on track. Using The “8 Steps To Effective Planning”: Learn this useful step-by-step process to evaluate your current situation, identify obstacles and resources, devise strategies and evaluate performance. Setting Specific Action Plans For Your Team: Using the lessons learned throughout the program, participants will set specific goals and action plans for themselves and their team. Explore The Basic Tools of Time Management : Effective time management can be seen as a process. Learn how to evaluate what needs to be done, schedule activities, and how to stay flexible while living up to current commitments. Focus On What’s Important As Well As What’s Urgent : Learn the difference between what’s urgent and what’s most important. Using time management tools, participants analyze how they currently spend their time and find ways of being more effective and efficient. Use The Production/Production Capacity Balance : Learn how to do more with less while being mindful of capacity. What are ways of expanding your capacity to produce? Practice Daily Adapting: Any team needs the ability to adapt and be flexible. Participants explore ways of balancing needs and adopting flexibility to their work and their projects. Focus On Managing Changing Deliverables : Explore how to effectively deal with timing changing on goals and additional work requests. One of the biggest challenges to any project is manage new requests or changes in expectations. Learn To Cope With Time Wasters : Every office has them… uninvited visitors, phone calls, mail and email, meetings, crises, waiting time, procrastination, and disorganization. Learn the best ways to handle these common distractions. Any group can benefit from better ways to address problems and make decisions, and this innovative model can help make sure you’re on target. Eliminate unworkable solutions and gain “buy-in” every time. The program initially looks at current problem-solving styles, and then moves to a unique matrix that helps find the most beneficial solutions. Through this process, we’ll discover the concerns of others involved in the decisions that we implement. Participants focus on ways to narrow the gap between planning and outcomes. This process can then be used to focus on results and benefits in current business situations. Identifying Underlying Causes : Get right to the main point of a problem to come up with both an effective process and the right tools. Using A “Rational/Systematic” Methodology: This model helps you analyze the environment, find real causes rather than just symptoms, explore how to gather information you need, devise alternatives, build consensus, and finally, implement solutions and monitor progress. Digging Deeper – Getting Past The Obvious : The group will find techniques that help look beyond possible symptoms to deterring root causes. They compare data from actual situations and explore ways to eliminate inappropriate options. Using Decision-Making Tools To Uncover The Best Solution(s) : Participants work through situations using a decision-making tool. From there, they develop and evaluate criteria, compare alternatives, assess risks, and ultimately reach the best decisions. Innovation and Creativity – When More Of The Same Isn’t Enough: Organizational inertia can be hard to overcome, but innovative and creative techniques can enhance any problem-solving process. Use proven tools to come up with higher quality results than usual safe approaches. Practice innovative thinking that focuses on multiple “what if” solutions. 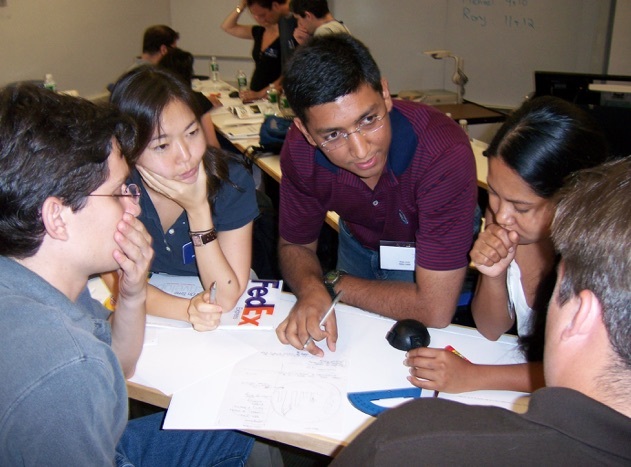 Practicing With Real-World Business Issues: Each participant presents a current business or client issue. In small groups, they utilize the resources of the group to come up with best answers. Making presentations is a critical management skill, but one that many people dread. Participants will learn how to to plan for and deliver effective presentations. Remember that the elements of a successful presentation never change: understanding your message, preparing, adapting to your audience, and keeping people engaged and interested. Participants will leave this session with a better understanding of how adults process information, and be able to use these concepts for more effective presentations. Organize Information Appropriately: Properly organized information is crucial to an effective presentation. Participants will examine ways to make sure they keep focused on their objective. Achieve Audience Involvement: An engaged audience means better understanding and retention by your listeners. Examine how to energize your audience and keep them interested and involved in what you are saying. Use Specific Techniques For Increased Effectiveness: Find out how to: use notes appropriately, begin with a good start, develop rapport, keep on track, and close on a positive note. Present With Confidence And Competence: In ways we may not even be aware, our non-verbal expression can be as powerful as the actual words we use. Learn to send a stronger message with both your words and body language. Practice Before Any Presentation: By making actual presentations participants will see the need for and the benefit of practice. Business correspondence makes a lasting impression, for better or worse. Participants will focus on how to write effective memos, letters and proposals, as well as explore how to report results and create effective e-mails. They will practice writing clearly and directly in a business setting. Write With Power and Influence: Many times, correspondence is the first point of contact we have to someone. Learn how to make a positive first impression and convey competence and confidence on paper. Participants will also learn how to be direct and get straight to the point. Use the Top Three Steps To Effective Writing: Any correspondence needs “plan, draft, and edit” to make it more professional and effective. Address The Needs Of Their Audience: Who are your readers? What do they want or need to know, and what you want them to do? When you arrive at these answers, your writing becomes more targeted for each specific audience. Recognize Common Mistakes in Composition, Grammar, and Style : Proper grammar, composition and style can make or break your credibility. Explore the most common mistakes in business writing and e-mail correspondence, and learn how to avoid them. Reach Readers Through Logic: Use the principles of critical thinking to quickly gain consensus, and lead readers to the right conclusions with your logic. Improve the Flow of Information: Properly used, facts and figures can help make your case without overwhelming your readers. Explore how to overcome common barriers, and how to avoid your meaning being misconstrued. Fine Tune Their Writing Style: Almost any long document can be more concise. Explore how to write it right the first time, and how to make your individual style work in correspondence. Handle Difficult Correspondence With Ease: There are ways to compose the toughest correspondence and deal with “touchy” subjects appropriately. Assertiveness is not synonymous with aggressiveness. It involves respecting the rights and dignity of others while standing up for your own. Our natural tendency is for “fight “ or “flight.” By learning effective assertiveness skills, we learn about our “third” option – verbal assertions. Assertiveness Style – “Influence Style Inventory”: Everyone has their own tendencies toward passive, assertive, and two types of aggressive behavior. Using a nationally recognized assessment, participants learn about each influence pattern and we explore the payoffs and penalties of each. Getting Your Point Across – Developing Assertive Messages: Learn ways to deliver a message clearly and convincingly while maintaining respect for everyone involved. Remember three critical steps – non-judgmental description of behavior, disclosure of feelings, and clarification of tangible effects. Dealing With Defensiveness – A Six Step Process: When feelings run high and people get defensive, a simple statement of assertion may not be enough. This six-step process helps to improve your effectiveness in defensive situations. Increasing Your Options – Dealing with Difficult Behaviors: Learn specific techniques for dealing with difficult responses such as hostility, withdrawal, tears, sidestepping debates, and dealing with questions. Building On The Basics – Advanced Assertive Techniques: Learn specific techniques to use when handling different situations and behaviors. Learn when to apply each technique and how to use each effectively. Receiving Criticism Constructively: Participants learn not only how to assert themselves with respect, but they also learn how to hear criticism without taking it personally. Using many of the techniques learned earlier, they practice listening, asking specific questions, expressing their concerns, and most importantly working toward a solution. In the quickly changing landscape of today’s business world, the ability to think outside the box is more important than ever. Doing things faster and more efficiently will only take us so far before we reach diminishing returns. Huge leaps in effectiveness occur when we are able to step back and discover different ways of approaching a problem. At the core of this type of change is our ability to think creatively within the context of real, rather than self- imposed constraints. Getting past old metaphors like “that won’t work” and “we’ve always done it this way” is where true innovation lies. This program will help explore creative thinking and instill a commitment to innovation. Separating Real From Self-Imposed Constraints: Our self-imposed limitations hold us back far too often. On average, over 60% of the rules or constraints that we believe exist are actually false assumptions. By singling out the true limits, constraints, and consequences of a situation, we are better able to challenge the existing process effectively. Envisioning Possibilities: Thinking creatively is not irrelevant, but rather a focused process that finds associations and leverages best practices. We demonstrate and practice several proven methods for making good on industry knowledge, personal experience, and process history. The ultimate goal is to devise an exhaustive list of alternatives. Evaluating Change versus Innovation: Change just to change will usually result in negative outcomes. However, well-founded change because of innovation, although often just as difficult to implement, will usually result in marked improvement and long lasting results. Overcoming Negativity and Obstacles: Knowing that most people tend to resist and fight change, it is critical that new ideas be presented in a manner that reduces resistance and increases overall acceptance. This means developing ideas so that others can approve both the process, and the outcomes. The objective is to attract followers who will support and drive the innovative process, rather than oppose it. Adopting An Innovative Mindset: Developing a no-limit attitude with a keen focus on challenging ineffective processes is the mark of effective innovation. The result is an individual who feels valued as an asset rather than an obstacle. Emotional Intelligence is a concept designed to help people increase their understanding of themselves and more effectively interact with others in an ever-changing environment. Emotional intelligence has been reported to be twice as important to our success than intellectual intelligence or technical skills. Learn to put your emotional intelligence to work! Explore the 4 components of Emotional Intelligence: We will examine the four different components of emotional intelligence and assess your personal strengths and potential development areas. Unlike IQ or personality, your EI can be developed over time. Better understand and manage yourself: Examine your level of self-awareness and how this contributes to your daily effectiveness. Explore methods for improving your self-awareness and strategies for managing both strengths and weaknesses. Improve your understanding of, and influence on others: Explore ways to stay in tune with the impact you have on the people around you. Learn to use that information to communicate more effectively, improve how you manage conflict, influence others, and effectively develop other people. Improve the strength of your team: Apply these concepts to your working relationships within your team, across the organization, and even with clients. Practice using real-world and relevant examples. Leverage your emotional intelligence on a daily basis: Identify strengths and development areas and set your own EI development goals. Set targets that are realistic and practical. Make EI work for you!